In our last blog we discussed salad bar location ‒ where it’s placed within the lunchroom. Before the hot line? Integrated into the service line? After the hot line? Before the POS? Every school site is different and presents different challenges with respect to placement. Just as important as where the salad bar is located, is what and how you are arranging the ingredients on the bar. 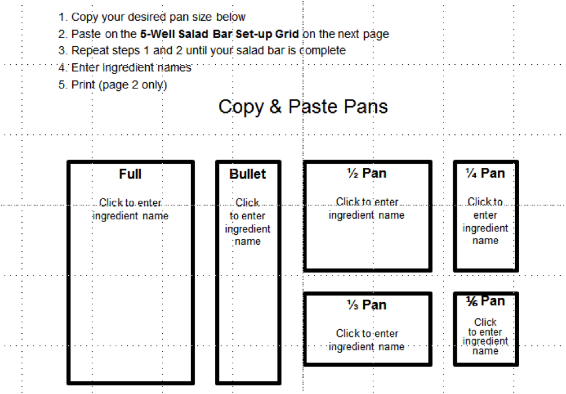 Before I dive in, take note that the Salad Bar section of The Lunch Box has a salad bar layout tool that allows users to move around various sizes of pans in order to determine ingredient layout options. I will be using this grid to make some points later in this post. There are a few reasons to spend some time thinking about what kids first see as they walk into your dining room. First, the visual impact of a salad bar can intrigue the senses. When a bar is well planned and stocked with a variety of tasty vegetables, composed salads, and fruits—it’s a sight to behold. Second, planning the flow is your method to controlling the student’s selection, the speed of your lines, and sometimes the mess. Third, does that flow of ingredients make sense based on whether your bar is two-sided, one-sided, is before or after your hot line considering how many kids flood your service area through lunch. Assuming the kids are flowing left to right in this illustration, then lettuce is first (which I always recommend because it’s bulky and less popular, but necessary). We even suggest teaching the kids a “Lettuce Plus 5” approach (or whatever number makes sense based on how many items you offer). Next are selections that can be put on the lettuce, followed by some standards—cucumbers and tomato (this is definitely a late summer early fall bar). Then we have roasted eggplant; although it might not seem a likely candidate for a larger pan, it’s soft and will show better if you give it some room. Fruits are next (always place near the end), and then a few toppings. Finally we have pans that hold squeeze bottles of dressings. Unless you have great monitoring practices in place for ordering, prep, tracking production, and leftovers, we recommend that you don’t change the selections each day or give the individual sites control over the selections. The presumption that kids want to see something different every day is popular, but having a balance between what is familiar and something new is a fine line. As we know, there are many kids who would eat a hamburger daily if they were offered it daily. Every child has different tastes, so remember that what you are offering on the salad bar inherently gives them variety and choice daily. Maintaining a salad bar ingredient production record that is separate from your meal production records for the State can assist your decision-making about what to keep or change in your salad bar menu as well as show you how well your sites are managing ordering and production. The salad bar record shows the detail of use over time in an easy-to-view format. If there is one action that will support long-term sustainability for salad bars as a regular part of your reimbursable meal—it is training and tracking. Key to your salad bar success is developing standard operating procedures like how full is too full for a container of ingredients, temperature control, keeping your pans cold. ( Yes – store the pans you are using on the salad bar in the walk-in. Just train your team where the clean salad bar pans live!) For a review of standard operating procedures check out our salad bar training video. Shifting the salad bar menus seasonally is popular and feasible in many regions of the country. This allows you to respond to the foods that your kids may be most familiar with as a part of their heritage. Be sure to label new foods and use menu boards to engage and educate your diners in the lunchroom. Did you buy that broccoli from a local farmer? Give a shout out to them on the board. We have ingredient lists and menu board templates available to download. Another strategy for meeting the meal requirements is using the salad bar to introduce unfamiliar foods like composed grain salads made with nutritious grains like quinoa, barley, spelt, or wheatberries. It is a very cost-efficient way to provide more complex flavors and variety with a low impact to your bottom line. Browse through our Recipes section and try something new soon. 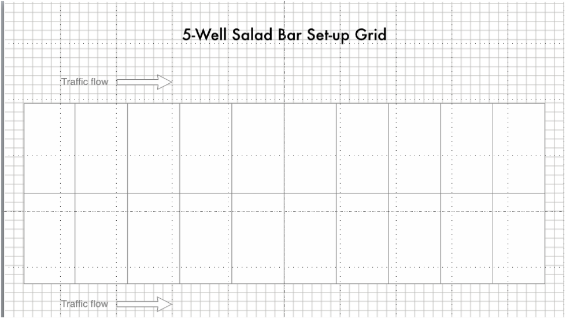 BONUS POINT: Send us a photograph of your salad bar layout and we’ll share it in our next salad bar blog! !